What’s that they say about all the best laid plans? 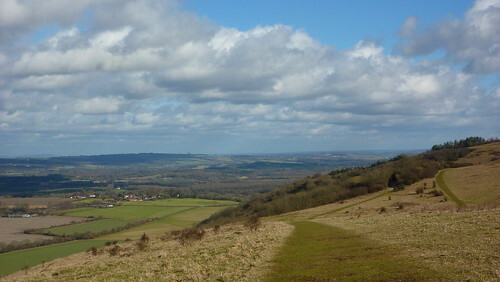 When I’d originally planned out my South Downs Way walking it was all so simple. Two weekends would see me do the first half. Then there would be a week off. Then a further two weekends would see me complete it. After doing the first two days I arrived back home with my feet feeling a little sore, only to take off my boots and find my little toes in a right state. The left one was worst, very red, swollen and very rubbed. And certainly painful whilst walking. A few days later it was getting better, however still sore and I reluctantly did some rearrangements to my plans. I’d planned to have the whole thing finished by mid-March however now that would be impossible – I had no more leave or spare weekends to spare before the next financial year. I was also worried. My walking boots were relatively new after my old ones had conked out, and whilst they had had a little wear, they hadn’t had anything major. March would see me doing eight days on the Pennine Way – would they be all right by then? So it was with some trepidation that I planned my trip to Petersfield two weeks later, preparing for another two days of walking. 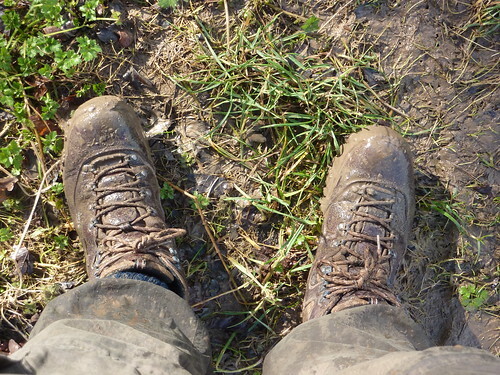 My theory was that I’d had my boots laced far too tightly for my wide feet. Well now it was time to test it out. The planning hadn’t gone well either. The weather forecast had been all over the place and the whole thing ended up being arranged rather at the last minute. Even getting a B&B had been stressful. Still, arriving back at the Hangers Way in Petersfield it looked like all might be okay. Well until it started raining after barely five minutes anyway. Even when it stopped, the Hangers Way was like some sort of mudbath having soaked up so much rain over the previous few days. It didn’t take long for my freshly cleaned and neatly polished boots to turn into some kind of mud splattered madness. 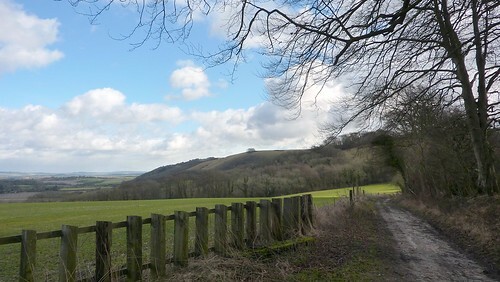 An hour later I was at least on firm ground as I re-joined the South Downs Way, walking along quiet country lanes. The sun had come out and it was looking like a nice day as I passed from Hampshire into West Sussex; walking along the obscure farm track that was once the end of the Way prior to it being extended to Winchester in 1989. I was now on what always feels like “Classic South Downs Way” – wide grassy paths on rolling and very windy hills, with stunning views of the patchwork quilt effect of the local countryside. True the South Downs are no Lake District or Scottish Highlands, however the views were something wonderful to behold, looking down into the valley and looking at the different villages in the distance. 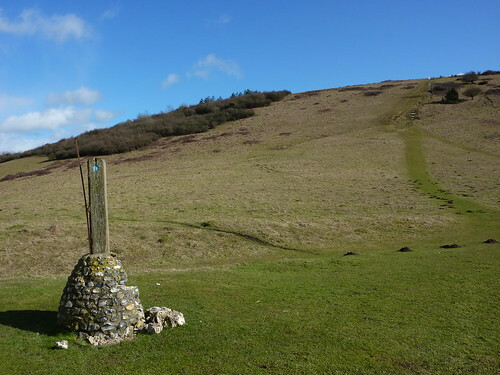 After Harting Downs came the second Beacon Hill on the South Downs Way. Officially the Way skirts round it, however I decided it would give me a good view of the surrounding area, and naturally set up off its steep slopes. The views were good. The strong winds blowing in from the coast perhaps weren’t. Coming back down off the hills, the Way took a slight detour into some woodland, restricting the views and (thankfully) the wind. 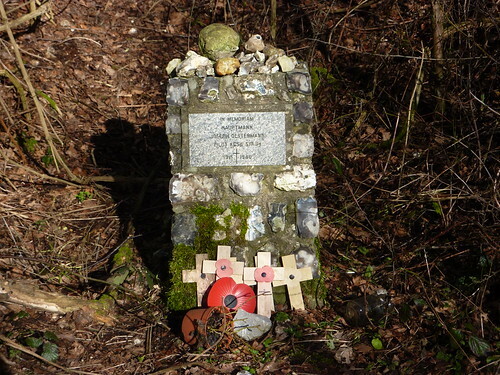 Whilst woodland is not normally the most exciting thing, this one did involve a War memorial – slightly surprisingly this one was for a German pilot. 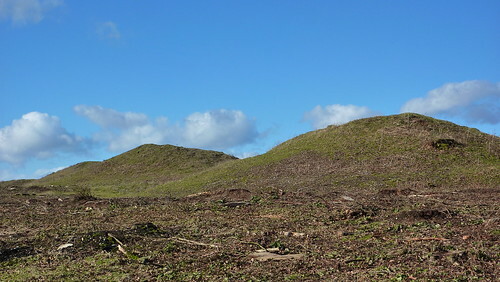 And if that wasn’t enough, there was The Devil’s Jumps – a series of large tumuli sited next to each other. The South Downs Way features lots of such tumuli and I have to confess that I find them rather difficult to get excited by as ultimately all you get to see is a pile of grass covered earth. All the interesting stuff is either hidden away, or is in a museum somewhere. Popping out of the wood once more it was back into more classic downsland, a hill of sheep and neat rows of neat clouds skudding through the sky. 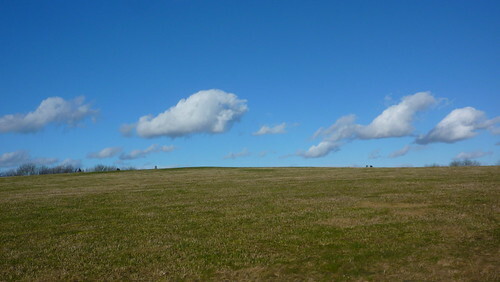 I’ve always loved the way you get clouds all running together in rows, with huge gaps between the different rows. And soon Cocking was once again in sight. Finding myself once more very early for my B&B, I spent a relaxing half hour sitting on a handy embankment at the side of a field chomping on some Kendal Mint Cake in the sun. 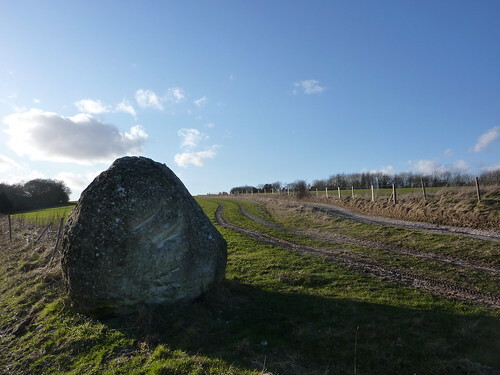 Walking past a large lump of chalk that was, by all accounts, a sculpture by Andy Goldsworthy (although if you ask me, just looked like a lump of chalk), I headed towards the main road and the end of my South Downs Way walking for the day. Go left and I’d soon be in Cocking. Unfortunately though I’d been unable to get in at a B&B there – one was full, the other was closed for the month. A third place – a pub – had re-opened after a prolonged closure, however its phone number seemed impossible to find anywhere. Still it was about 5pm when I arrived at Singleton, a rather lovely village full of old cottages and thatched roofs. 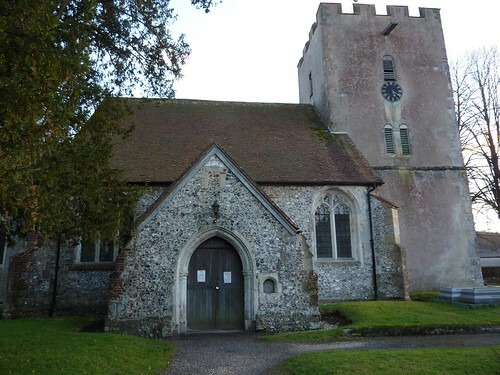 The village church looked equally old and impressive, and on my arrival at Orchard House B&B, I found myself in a lovely little self contained room with a nice big bed and simple but nice furnishings. A shower and a rest later, and having checked my toes – all fine bar the fact that the left little toe nail was coming off on one side (whether it had been like that before, I couldn’t say however there was no pain so I presume not…) – I headed to the nearby pub for a few pints and some grub. 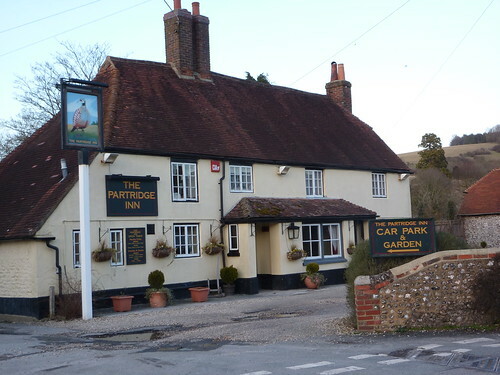 The Partridge turned out to be a 16th century inn, and I sat in the wood beamed front room supping my pints of Harvey’s Best and Fuller’s London Pride. Ordering some food – Terrine of Duck and Pheasant, followed by Salmon and Chive fishcakes – I settled down to read my book, noting with some slight surprise that everyone else in the pub seemed to favour sitting in rooms other than the one I was in. Well, okay, one room was “the restaurant” and the other had the bar in it so perhaps not that surprising. First Published: 15 March 2010. Last Updated: 30 August 2015.